Why Choose 3D Systems ProJet X60 Series Color 3D Printers? If you're like others who rely on 3D printing for conceptual models and rapid prototypes, there's a good chance that you've been wanting to incorporate more color into your designs. The ProJet X60 Color 3D Printer series was designed to make color 3D printing easy, quickly and cost effectively. 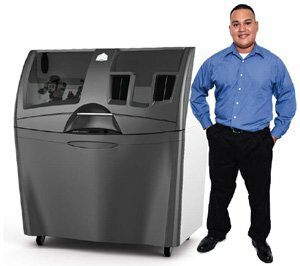 ProJet X60 series color 3D printers use ColorJet modeling technology, allowing you to create full-color realistic conceptual models in any color combination imaginable. Not only will this allow you to expand and expedite your development phases, you'll also be able to present clients with models that look nearly verbatim to the finished product. As with most 3D Printing process', each model is built from the bottom up, layer by layer and one cross-section at a time. X60 series 3D printers offer the fastest vertical build speed in the industry, and were designed to significantly increase production development times. Using their advanced full-color and high throughput technology, you'll be able to create stunning 3D models in hours as opposed to days. Moreover, the X60 line allows you the convenience of stacking and nesting parts to better streamline your productivity, while helping prevent costly early-stage errors. Regardless of whether you're creating monochrome parts for a rapid prototype, or a detailed full-color realistic design, the X60 series is a wonderful tool to have at your disposal. It allows you to present better concepts to your clients, while keeping them informed on finite analysis results, specific stages of the manufacturing process, and the details of each separate part of an assembly. Who Can Benefit from ProJet X60 Color Printers? One of the best features of the X60 series, is its simplicity and easy integration into virtually any educational or office environment. It features auto setup and recycling, and its new mobile controls allow users to operate it remotely. Keep track of the printer's status while simultaneously monitoring job progress and supplies from through your workplace.